Earlier today, worshippers in the central Iranian province of Isfahan used the occasion of Friday prayers to protest against the government. According to Radio Farda, the protesters turned their back to the Friday prayer leader as a gesture of disdain and chanted anti-regime slogans. 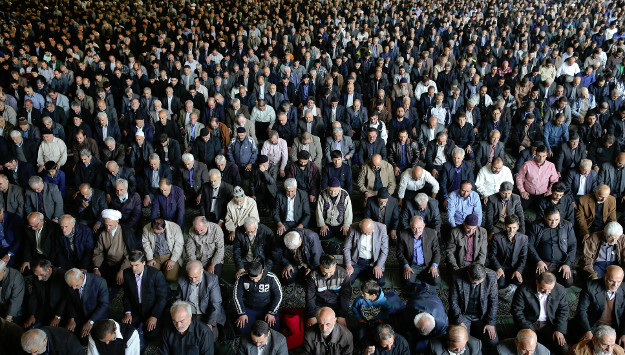 Videos circulating from the protest scene on social media show some protesters shouting: “Turning back to enemy, facing the country.” Friday prayer leaders in Iran are representatives of Supreme Leader Ali Khamenei. Others also chanted slogans against the country’s state-run broadcasting agency and the Rouhani government. Most of the protesters appeared to be farmers who have been complaining about water scarcity in their regions. Comment: Water scarcity and the government’s inability and unwillingness to address the problem have triggered angry protests in different parts of Iran in recent months. The water shortage in Isfahan has particularly reached crisis point. Last week, scores of angry Iranian farmers in Isfahan clashed with local security forces over a water dispute, the BBC Persian reported. The police used tear gas to disperse the protesters, who were chanting antigovernment slogans. One key demands of the protesters was to demolish a pipeline that transfers water from their region to neighboring Yazd Province. Videos published by the BBC Persian showed that hundreds, or even thousands, of protesters were marching toward water transfer facilities. Some protesters were chanting slogans from the Iran-Iraq war era, calling on the “Eastern Army of Isfahan” to prepare for the destruction of the pipeline. In one of the videos, a police officer tells the protesters through a loudspeaker that they “should not hold the American flag in their hands” – triggering angry reactions from the crowd. The protest happened in Varzaneh, the capital of Bon Rud District, east of Isfahan City. Once famous as the “jewel of Isfahan”, Varzaneh is a historic city and more than 90 percent of the population there make a living through farming and agriculture. The region has been suffering worsening water scarcity and dust storms, which have severely impacted the local residents’ livelihoods. The water shortage problem in eastern Isfahan is emblematic of a nationwide crisis in Iran. Water scarcity and air pollution have triggered sociopolitical and security challenges across the country, and environmental experts warn that the problem could deteriorate further. Several people have been killed in water disputes in various parts of the country. Water and environmental problems were also among key reasons behind the latest antigovernment protests across Iran in December and early January. Scattered protests over water and air pollution issues have continued in several regions in Iran since then. The water shortage has lately also strained Iran’s relations with its neighbors. With the collapse of ISIS, Iran and Turkey are stepping up competition for the control of water in the region, while Iran has threatened to severely restrict the flow of water into Iraq. Moreover, Tehran and Kabul have publicly sparred over water issues recently, as Afghan officials accuse the Islamic Revolution Guards Corps (IRGC) of arming and training Taliban groups to sabotage dam and power projects in western and southern Afghanistan. Iranian leaders blame neighboring countries’ water management policies, the presence of US forces in the region, and climate changes for Iran’s growing environmental problems, yet they largely overlook corruption and mismanagement in the country as well as wrong government policies responsible for the deteriorating crisis across the country, particularly in underdeveloped eastern and western provinces. Moreover, while the Iranian regime spends billions of dollars annually on defense and military programs as well as in foreign wars, it largely ignores serious environmental problems that directly affect the lives of the Iranian people on a daily basis.